Banana Milkshake E-Liquid by Smoknic: Personally I love banana milkshake (the real one) so when I tried this I wasn't holding out much hope but, to my surprise, it tastes really good and gives a good nicotine hit too. Please try it you will love it. 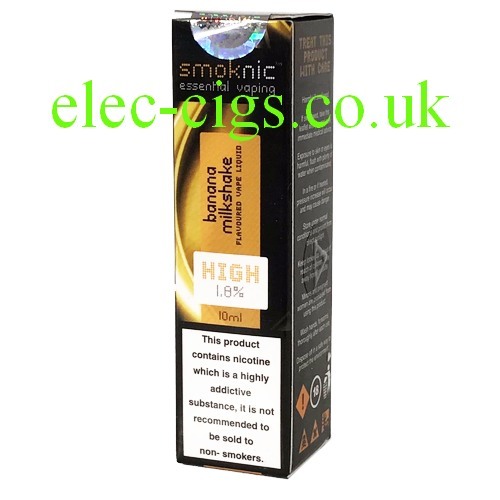 Banana Milkshake E-Liquid by Smoknic is available in a 10ml bottle and comes in a choice of 3 nicotine strengths, which are: 6 mg (0.6%), 11 mg (1.1%) or 18 mg (1.8%). Enjoy the best value premium e-liquid available anywhere, which can only be purchased in multiples of 10 bottles. Banana Milkshake E-Liquid by Smoknic: this e-liquid can only be purchased by persons aged 18 years or older. This product contains nicotine which is a highly addictive substance.